Find all of Petco Black Friday 2017 ads, deals and see what the Petco Black Friday store hours are like near you. 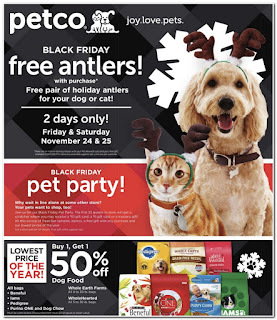 Shop and save with Petco Black Friday coupons on all pet foods and pet care essentials for your dog, cat, fish and more. Don't forget to follow the Black Friday news and check out the Petco Black Friday ad for doorbuster specials before dropping in store this Black Friday.